About a while back WDAC, Kathmandu along with TISS, Mumbai lunched a program for young youths interested in social work for disaster and livelihood management. Samasty Shakya , one of the students who was selected for the program, is currently with her colleagues in TISS, Mumbai. She was one of the student selected for the course. She completed her Bachelor’s Degree in Social Science focusing on Community Development Work from Diaconia University of Applied Sciences, Finland. 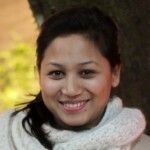 She has worked with organizations like CWIN- Nepal, Sang-Sangai, Bal Kendra and Antilan Koulu, Finland. Her work with Society for Empowerment (STEP-Nepal) and Nicehearts Ry, Finland provided her knowledge about women empowerment. Her work with Society for Empowerment (STEP-Nepal) and Nicehearts Ry, Finland provided her knowledge about women empowerment. In a personal interview she shared with us some of her experience and gratitude. On a mail, she writes " Schedule for 2 weeks has been given to us. The classes are going well, we are doing assignments and learning new every day. We are very thankful to Mr. Nanda Kishor Mandal sir for providing us this initiation". How did you come to participate in the PG Disaster and Livelihood Recovery Program? While I worked as an Emergency Food Security and Vulnerable Livelihood Officer for 6 months. I see my community and I lack something. We have expertise form abroad but we lack knowledge and understanding on recovery. Now as a year has passed we are still focusing on relief and affected people are waiting for relief. I would like to see a just community where we will move form relief to recovery and gradually settle down to normal life. Livelihood recovery is one of the key components to go back to the things as they used to be before earthquake. How did the earthquake effect you and what was your immediate action for the devastation from the earthquake? When the devastating earthquake shook my home all I was worried about was my family, I did not cared a lot about others but only family’s safety. But as we went out in the community to be safe, people were crying, panicking, shouting. The first thing I did was, assisting people to open ground, and along with my family and neighbors I sat quietly in open space as well. One by one bad news continued, Dharahara went down, Khasthamandap, Basantapur Durbar Square, Bhaktapur Durbar Square and many people lost their family members. After that, me along with my few friends, we started hygiene campaign in Bhaktapur. We engaged few of the community youths in our campaign and handed over further cleaning program to locals. We went to Tudikhel and other effected areas accompanied by volunteers from other forums. On the side we were creating awareness to parents in the temporary camps about safety and security of their children as during rush, children may be displaced. You are well aware about the huge donations Nepal Government received from all around the world. Do you think It has been put to good use? What do you have to say about that? Yes, Nepal did receive a lot of funds from around the world for helping the people who suffered. However, as far as i know i cant say they have been absolutely fair putting them into actual use. lot of people are homeless, don't have food and face other infrastructural problems. and I doubt that economic blockade we faced couple of months before has made it any easier. Instead we see actors like Sita Ram Kattel generously contribute their share of help to the society. How did you think earthquake effected Nepal? No doubt, earthquake has devastated so many lives (physically, emotionally and spiritually) we are still in trauma. Even today when my chair or bed moves my mind goes in alert mode. Earthquake 2015 has taught us a lesson. It has somehow created harmony in the community, communities sharing roof (temporary shelter) and sharing kitchen during emergency phase if one good and basic example. People learned to help each other in spite of caste or religious differences. How prepared do you think Nepal was or you were for the earthquake? Yes, ironically I was asked the same question in a youth forums i worked with during the earthquake. On the interview the question buzzed my mind. I thought for a while and the answer was, ZERO percent, we have been hearing news from around the world about earthquake, we knew, we are in earthquake prone zone, and we hear in radios the preventive measures. But somehow we were negligence and not prepared. I thought it then, if there were any training or study program on disaster it would have been great opportunity to attend. What are your ideas, plans for facilitating livelihood recover among earthquake affected communities? I think a great way to start would be to start from the root, involve the peoples from the effected community. Youths like myself should be involved in training campaigns. I believe that we need aware yet experienced and capable persons to handle the crisis time like that. And it involves not just earthquake but other similar disasters that may befall us. Since the earthquake many lost their jobs, many homeless. In cases like this we can lunch free training programs of occupations like handicrafts and other household occupations that can help them sustain their lives. similarly in hilly areas peoples may loose their lands and crops because of earthquake. we can provide them tools and machines that can help them get right back in their feet. In crisis times like this government has the power and should utilize the willing youths who want to work for Nepal Government. Government can open job opportunities for the youths and capables from the effected community.